Frances, Cath, Thomas and Isobel drove to Palnure, to the car park for those walking, in particular, up Cairnsmore of Fleet. The other walkers were: Jim (leader), Ken (back up), Richard, Peter x 2, Mary x 2, Audrey, Margaret, Leslie, John, Carl, Catherine, Audrey and Tom. 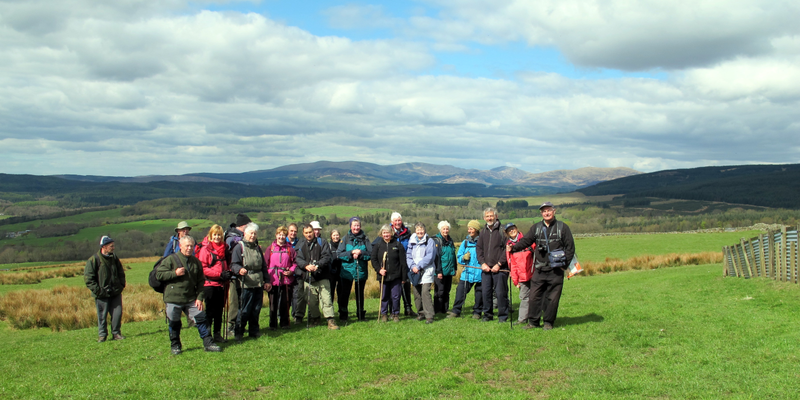 On a dry but cold morning of broken sunshine, 22 walkers gathered at the Cairnsmore Car park for the walk to Creetown. 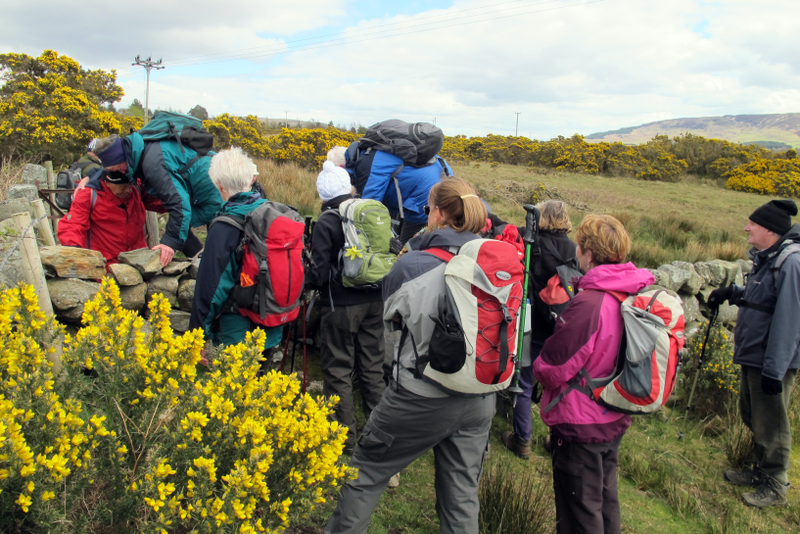 The walk began by following the route of the old Portpatrick & Wigtownshire Joint Railway between Palnure and Creetown. This was converted to a walk and cycle path in 2000 and is a part of the National Cycle Route. After passing through Cuil and Blairs woods, trees were replaced with a panoramic view of the Cree estuary emptying into Wigtown bay. The path now crossed above Blair House and Spittal farms. 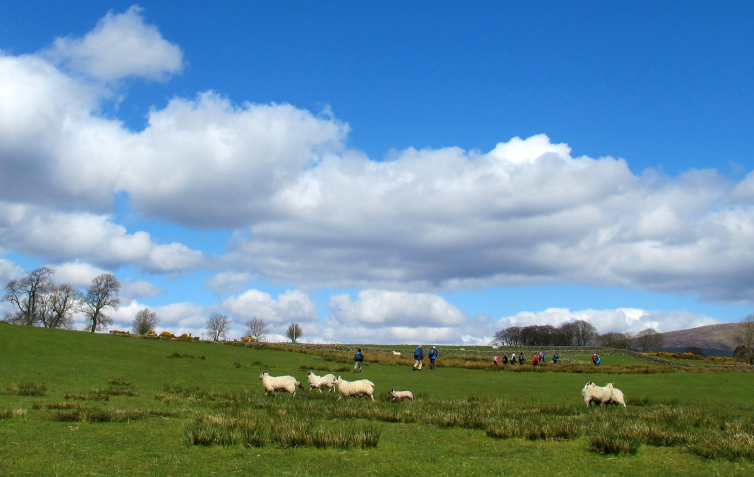 With the late lambing season recently started, neighbouring fields were a mix of new born lambs and expectant ewes. Beyond Spittal, the route now followed the road towards Creetown. This was followed for a few hundred yards to Lennies, before accessing the public footpath down through Barholm Mains. A pair of horses galloped in an adjoining field. A line of old large beech trees led to the 'Coach House' of Barholm Mains. These were the stables of Barholm House, a Robert Adam designed classical country house unfortunately destroyed by fire in the 1950's. After a short walk through the woods, the Barholm bridge was crossed into Creetown. Bridge Street led to the Moneypool Burn and the steps up to the Gem Rock Museum. 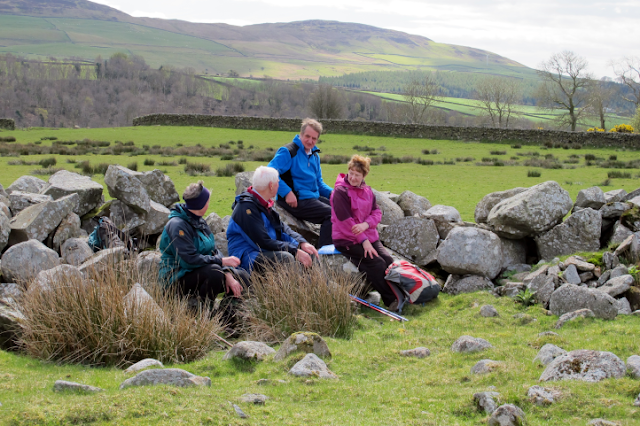 Rucksacks were now discarded for a variety of wonderful refreshments in the cafe. I was first into the Gem Rock Museum Cafe and made sure of my scone and tea and got Isobel a mug of black coffee. She turned down the offer of a cake, much to my surprise – it turned out that she was expecting to go to another cafe on the way home! As usual we were a jolly crowd and enjoyed this break in the walk, from 11.30am to noon, and then set off on the next section of the walk. Too soon and reluctantly the walk was resumed. The route now followed the Moneypool Burn to Chain Bridge. After a short road walk, the riverside path was accessed. 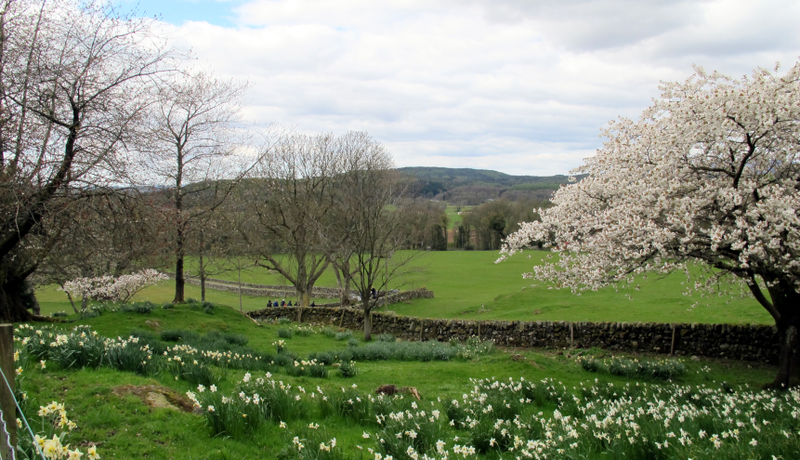 Wood anemone, celandine, bluebells and other wild flowers and plants flourished. Crossing Chain Bridge the group now took to the fields to cross the disused 'Paddy Line' on the Gatehouse to Creetown section. 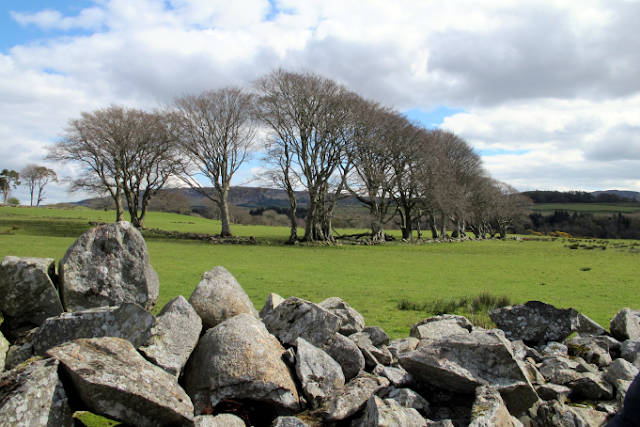 After following a line of old gnarled beech trees, a circle of large boulders made an excellent wind break for a lunch stop. It was then that I realized I had left my lunch at home and Mary (Cairnryan) offered some of hers to me. Following lunch, the concrete road up to Crinan was accessed. 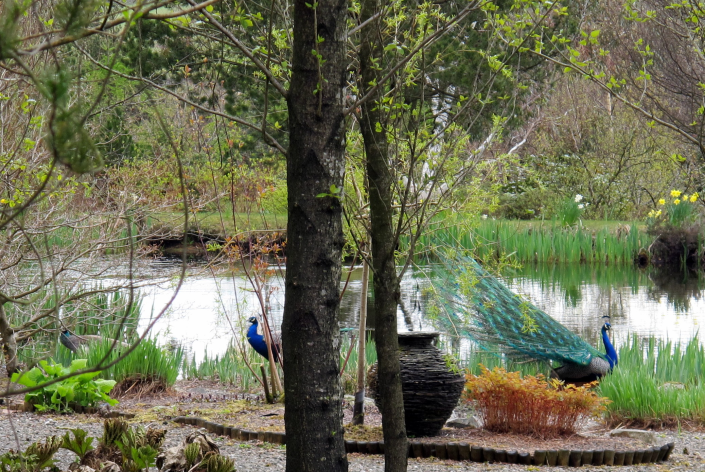 At Crinan a peacock was watched displaying its colourful array. Now concrete road became farm track and led to Clanary. After passing the time of day and discussing new born lambs with the good people at Clanary, the hill track was taken to round Blairs Hill. To the north east, the 'Door of Cairnsmore' was prominent. Soon the forest at Kirroughtree and Newton Stewart became visible. Reaching the sheep pens above Cuil, a wonderful vista lay below. The Cree, the Machars and the Minnigaff hills were all in view. With the tide out, the Cree appeared as a small trickle in the confines of its tidal banks. Neighbouring fields were again alive with the sounds of new born lambs. At Cuil farm, banks of daffodils, cherry blossom and other colourful flowers were a magnet for the photographers. The farmer, a recent award winner with the Blackface Sheep Breeders Association was met and thanked for his indulgence of the ramblers during lambing time. 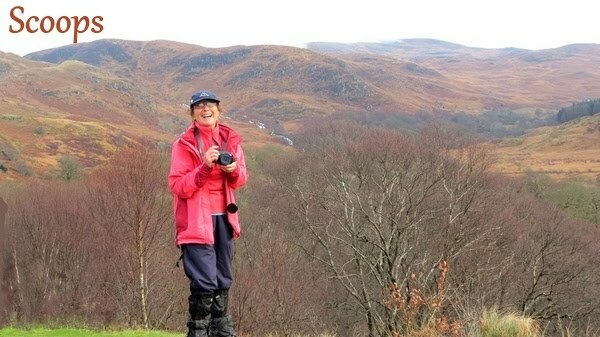 From here it was a short distance to the car park and the end of the walk. 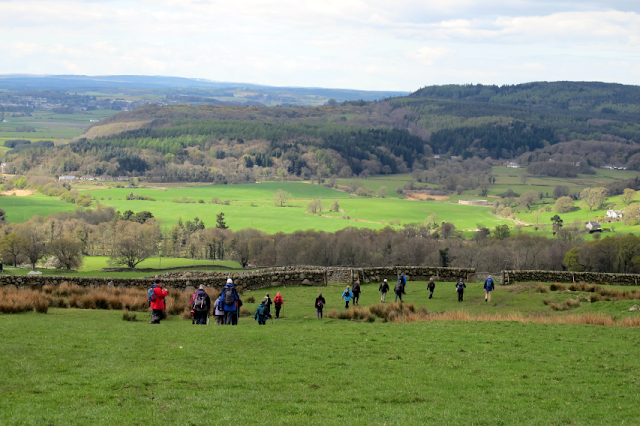 Despite our earlier visit to the Gem Rock Museum, most of the walkers were happy with Isobel’s suggestion of getting further refreshments in Newton Stewart so 12 of us arrived at Cinnamon by about 3pm. I phoned to find out if any scones were left - there were none but the banana loaf I had more than compensated. Audrey, Duncan, Irene, the two Mary’s, Ken, Margaret and Catherine all enjoyed their drinks and cakes too.